Do you remember that sentence: „If only walls could talk“? Well — our history curators found a way to make walls talk. The “Path of History”® is the trademark we use to tell a story. As of 1986, Andreas has been instrumental in documenting and featuring our rich history through his wonderful publication “The Oriental” – The Amazing Tale of Bangkok’s Legendary Hotel. The path of history that Andreas has created in the hotel compliments perfectly the bestselling book he has authored. Guests from across the globe continue to be delighted in taking home with them a piece of The Oriental’s history with them. Curator and book author Andreas Augustin takes general manager Amanda Hyndman and hotel manager Marcus Bauder through the new exhibition at The Oriental. 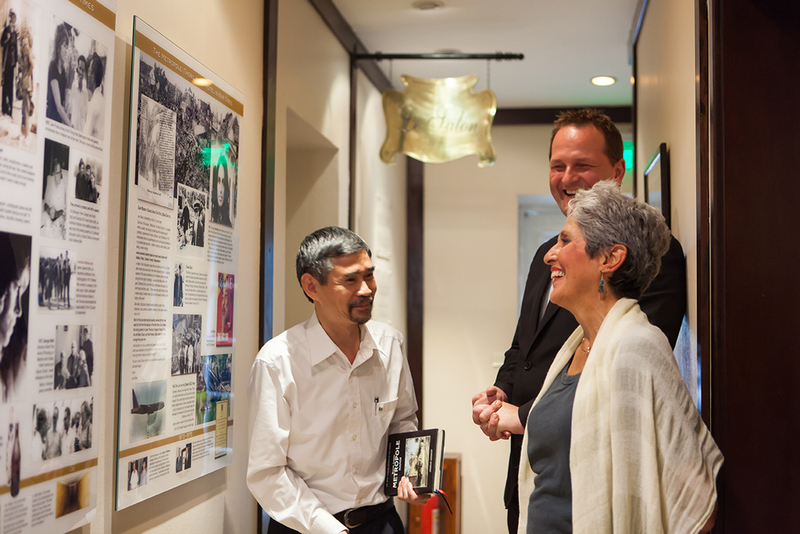 It can be about the history of a famous hotel in a permanent exhibition. In other places we concentrate on a building, a personality, a city, a region. They all have one thing in common: they have a story – and we tell it. Kai Speth was General Manager of the Sofitel Legend Hotel Metropole in Hanoi, and instrumental in setting up The Path of History. You deserve an Oscar for promoting the history of the most famous hotels in the world!